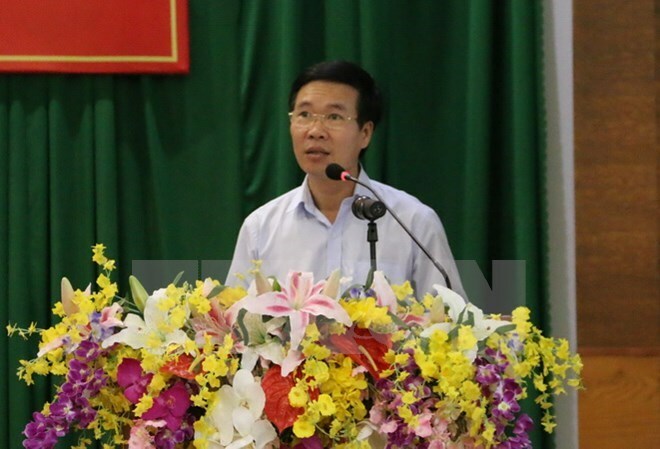 Kien Giang (VNA) – The fifth theoretical workshop between the Communist Party of Vietnam (CPV) and the Lao People’s Revolutionary Party (LPRP), themed “Rapid, sustainable development,” opened in Vietnam’s Mekong Delta province of Kien Giang on August 3. In his opening remarks, Vo Van Thuong, Politburo member, Secretary of the Party Central Committee and head of the CPV Central Committee’s Commission for Information and Education, said the workshop is significant theoretically and practically. It is taking place at a time when Vietnam and Laos are marking the 55th anniversary of their diplomatic ties and 40 years of the signing of the Vietnam-Laos Treaty of Amity and Cooperation, he said. Vietnam is implementing the Resolution adopted at the 12th National Party Congress and Laos is also materialising the Resolution of the 10th Party Congress, the official added. The two-day workshop offers an opportunity for Vietnamese and Lao scientists to exchange experience in socio-economic development, especially socialist-oriented sustainable development. Thuong reiterated the Vietnamese Party’s viewpoints on rapid, sustainable development, and introduced experience the country gained over the past years as well as orientations and tasks set for the time ahead in order to improve the efficiency of the Party leadership. Rapid, sustainable development is the cause pursued by the entire Party and population, he said, noting that all people have equal chances to develop, contribute to development and benefit from its outcomes. Thuong stressed the need to ensure rapid, sustainable development on the basis of ensuring the macro-economic stability and improving productivity, quality, efficiency and competitiveness of the economy. It is a must to closely combine economic development with cultural, social and environmental development, the readiness to cope with climate change, and national defence and security, he said. The official expressed his hope that the two sides will regularly share theoretical and practical experience, contributing to spurring rapid, sustainable development, and successfully carrying out reform in each country. Kikeo Khaykhamphithoune, head of the Lao People’s Revolutionary Party (LPRP) Central Committee’s Commission for Propaganda and Training, also highlighted the LPRP’s viewpoints on sustainable development and briefed the workshop on Laos’ experience in this field.